Who is Brasseurs du Monde? An emerging player in the fast growing world of microbreweries. Our brewing style goes from easy to drink beers, developed for the general public, to strong and generous beers, appreciated by a growing number of consumers. We cummulate more than 60 years of experience in the brewing industry. This enables us to respond to the constantly changing demands of consumers. Brasseurs du monde is working is slowly making it’s way among the best brewers in the world. 100% natural beers made from malted barley, with occasional, specific ingredients, always natural, that allow us to achieve a desired style or a particular taste. We brew 5,000 liters at a time in a state-of-the-art brewing system. A bottler with rotating head of Italian origin dedicated to 500 ml bottles. A bottling machine with rotating head of Italian origin allowing us to produce different formats. A double-row canning machine (2 x 4 heads). Our current production capacity is over 14,000 hl / year. 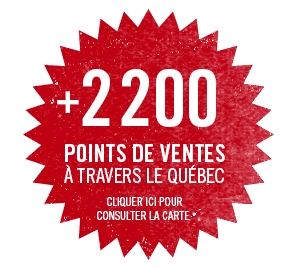 Our products are distributed to more than 2,200 retailers and nearly 300 restaurants and bars in Quebec. We offer a complete selection of beers that meet consumer expectations. More than 60 beer brewed annually or occasionally: Gamme Fruits, Hors-Séries, marques privées, etc.